I have a lot in common with David Rovics. We are both artists- he is an American singer/songwriter, I am a Jazz artist, we are outspoken, we both oppose imperialist wars and we also believe that ethics and aesthetics are somehow related and can bring a change. For many years I’ve been overwhelmed by the simplicity, the honesty and the directness with which David delivers his message. Gilad Atzmon: Music and politics, shouldn’t they be separate entities? David Rovics: Music without politics is fine. Politics without music, I’m not so sure… Politics needs music to keep it human, to keep it connected with humanity. As far as politics in music, it works well because you can tell a story in a song that doesn’t ring the same alarm bells as it would if you told the story some other way. I think music — and other forms of artistic expression, but especially music — is the best way to bring someone somewhere you want to bring them, if you can’t take them to the actual place you’re singing about. Gilad Atzmon: When did you realize that music can have such an impact? David Rovics: At the age of 12, in 1979, when I was first exposed to the then fairly thriving anti-nuclear movement in New England. It was definitely the culturally-oriented folks who had the most impact on me, though the ones who wrote books and such also had an impact. But the way the musicians and performers could really bring people together, around a pretty depressing issue, and then foster that essential sense of community, impressed the heck out of me at the time, and has ever since. 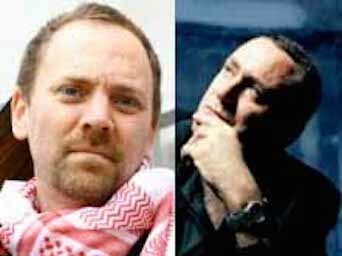 Gilad Atzmon: Do you feel that you make a difference? I, for instance, started to realize that I was making a difference when the battle against me became a global campaign. David Rovics: Certainly if I can believe the emails I get and the nice things people say to me on a regular basis, I’m making a difference, in that I’m helping people to think and to feel and to carry on. At least that’s what they tell me. That wouldn’t be surprising, since other people’s music has had that kind of impact on me. It also helps me feel like I’m making a difference that even though I don’t have any hits or anything, at least I’m on a government watch list and the spies are reading my blog. Maybe I have helped them. Gilad Atzmon: That is funny. If I understand it correctly, two years ago you lent your support to me and my work. You witnessed the campaign against my book, The Wandering Who, which inspired you to read the book. I think that you suggested that every Jew knew that what I am writing about is true. I was very happy with your article, but I understand that since then, some activists and organizations have ostracized you. Is it true? David Rovics: Yeah, where to start… I’ve been called an anti-Semite and a fascist and all sorts of other ridiculous things ever since I first said anything publicly about Palestinians being human beings. A couple of years ago when I was planning a tour of Europe as I usually do every spring, I started getting frantic emails from people in England who were upset that I was doing a gig with you. They said I should cancel the gig on the grounds that you were an anti-Semite. I’m naturally allergic to such claims, , so rather than following their advice, I found your book online, read and loved all of it, both the content and the writing style. When I failed to cancel the gig with you, some of your critics leafleted at one or two of my England shows, and came to complain to me about you at other shows (one of which you were at in person). Since then, there are organizations who were apparently planning on tabling at an event who allegedly decided not to do so after hearing that I was not part of the anti-Atzmon league. Sometimes people say negative things about you on the assumption that I will agree with them, and then everything gets very uncomfortable when I tell them that I loved your book and stuff like that. I have heard it rumored that there are gigs that haven’t happened because of my connection to you, but I don’t know if that’s true. In any case, my tours keep getting better, so if there’s been any negative impact, it’s not measurable. I do have some very good friends who don’t like talking about you or the subject of your book, which is discouraging for me, but I just try not to bring up anything related to Gilad Atzmon or Jewish tribal identity with them, and then everything’s kosher. What I get especially tired of is people saying you said something at one point, in some situation where of course I wasn’t there and can’t know what you said or didn’t say, but then they want me to argue the point on the assumption you said this or that. Lately I just say that I’m happy to discuss the questions raised in your book if they want to, but that I’m not your representative and can only give my interpretation of things, or my understanding of your perspective, as laid out in your excellent book. Gilad Atzmon: What can we learn about the fear of intellectual exchange within in the Left? Is it a new development or was it always like that? David Rovics: I don’t know how much we can generalize about the Left here. Maybe we can, I’m just not sure. But certainly we can say that the questions of Jewish identity, Jewish history, and exactly what is anti-Semitism are very raw topics in various segments of the Left, especially, it seems, in the US, England and Germany. This we can say beyond doubt. It seems most people would rather just not talk about these things. And if you so much as postulate that there is such a thing as Jewish tribal identity, at least enough to be able to critique the phenomenon, then this somehow makes you anti-Semitic. Whereas, if you talk about, say, the culture within the Catholic church, and Catholic tribal identity, in most western societies this is perfectly acceptable. Except in Northern Ireland, where any such talk will make people think you might be a member of the UVF. But with the Jewish question, the whole hypersensitivity thing is much more widespread than just those six counties in Ireland. Gilad Atzmon: I must admit that like you, the relentless campaigns against me have only contributed to my success as an artist. It is far more affective than a PR machine. As for Jewish power, I guess that it is better be defined as the capacity to silence criticism of Jewish power. I believe that the search for beauty is an inherently genuine endeavor. The aesthetic gratification and the sublime are pure and truthful instants. Accordingly, I believe that this is the true contribution of artists to politics. We inject a breath of truth into a decaying culture that is suffocated with deceit. I was very happy to read Roger Waters spitting out the truth about the Jewish Lobby in the USA. Were you surprised to find out that not a single solidarity organization or activist stood up for him once the Zionist league went for his neck? David Rovics: I like the notion that “Jewish power,” when the term is used in the sense that terms like “Black power” or “women’s power” have been used in the past, is in part the power to squelch any criticism of the very notion of the phenomenon itself. Also I can imagine some people reading this interview freaking out at your use of the term “Jewish Lobby,” but I would remind those people: this is the term the lobby itself uses, the term Israel uses, and the term most of the media uses. You don’t have to like that — I don’t — but it’s a fact. Anyway, regarding Roger Waters, I haven’t followed closely what he’s said and haven’t heard about how the Zionists freaked out at him, but everything I’ve heard about his stand on behalf of the Palestinians has been entirely positive. Maybe I’m out of the loop, or maybe I just know too many Pink Floyd fans. I think Roger Waters is a brilliant artist and songwriter and I’ve been very happy to hear of his public proclamations about the Wall and such, even though I haven’t been paying close attention to them. Gilad Atzmon: A long time ago I lost my belief in politics and activism. I see myself as a totally independent post-political person. I believe that we must first reinstate ethical thinking. Can you see art and artists leading such a shift of consciousness? David Rovics: Reinstating ethical thinking sounds like a brilliant idea. More love, more common sense, and less ideological rigidity seem good, too. Yeah, I think artists have a vital role to play in any such process. I think art naturally tends toward expressing things in a more three-dimensional way than more cerebral forms of expression. Gilad Atzmon: A final question, can you name a few contemporary artists who inspire you at the moment? David Rovics: In terms of artists who have gotten a lot of guff from a lot of people for very questionable (and very different) reasons, I’ve been thinking a lot of the connections between me, you, Michelle Shocked and Frank Turner lately. They are inspirational musicians as well. I suppose in terms of contemporary songwriters who speak to me most powerfully now and for many years, Jim Page of Seattle and England’s Robb Johnson probably top the list. Attila the Stockbroker has been hugely inspiring to me, as has Alistair Hulett, and both of them introduced me to a lot of new music in the courses of the tours we’ve done together, for which I’m very grateful. While driving my daughter to school I’ve become familiar with major label pop artists, like the teen hits and stuff, over the past year, since she discovered this stuff, and that’s been a very interesting and educational experience, though perhaps the impact on my own music has been limited. Jeffrey Blankfort - Are there Israel lobby gatekeepers and damage control squads on the Left?